Northern Ireland’s second cohort of Dementia Champions celebrated their graduation at a ceremony held in their honour recently in Antrim. Health and social care staff from across NI, who work in Health and Social Care Trusts and in non-statutory health organisations, were successful in completing this innovative training programme in professional dementia care. Photo gallery from the event available here. 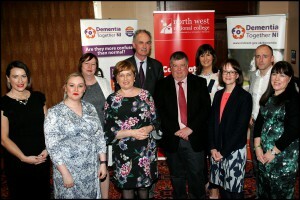 The Dementia Champions Training Programme was developed and provided in partnership by the Health and Social Care Board, the Public Health Agency, Connected Health, North West Regional College, the Department of Health and Atlantic Philanthropies. The programme enables students gain knowledge and skills on all aspects of dementia care including receiving a dementia diagnosis, research and evidence-based practice, communication and designing enabling environments. The course is delivered via a blended learning approach of five study days, online resources and the submission of work-based assignments. The first cohort of Dementia Champions in Northern Ireland graduated on 1 February 2017; one further cohort will complete the training programme during 2017. This will bring the number of Dementia Champions in Northern Ireland to over 300. Volunteers and staff from Dementia NI, staff from across the voluntary, statutory and independent sectors, and, academics and regulators were thanked for their ongoing contribution to the development of the Dementia Champions training programme.